Since moving into the Portland Works in January 2015 I have had a desire to learn more about knife making. 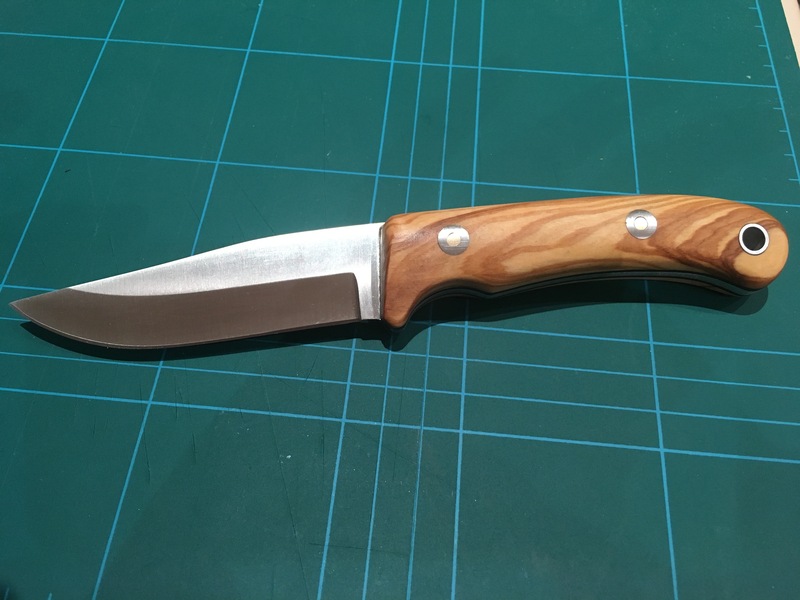 Obviously there is a long tradition of knife making in Sheffield generally, and more specifically at the Portland Works (https://www.sheffieldhackspace.org.uk/585) so it felt fitting to start exploring this new interest at the hackspace. Fast forward 18 months and I’d still not made any progress but a few minutes spent in our neighbors workshop (http://stuartmitchellknives.com/) during one of the Portland Works open days inspired me further and I went home that day and ordered a piece of tool steel with the firm intention of getting moving. However life got in the way yet again and a temporary pause was once again placed on my project. When I did finally think I had some quality time to spend on knife making I pulled out the piece of steel I had brought and looked at it. Something was nagging at me. Some advice I had been given was “Start small”. Great advice for any new endeavor of course, but more specifically I’d been advised to make a knife from a kit instead of a piece of steel. The reason being is that finishing a knife off, attaching and shaping the handles essentially, is quite a challenge in itself so the first time you do it it probably isn’t the best idea to attach them to a piece of steel you have spent hours working on and then mess it up!! Much better to learn your lessons on a blade you haven’t got so much time invested in. 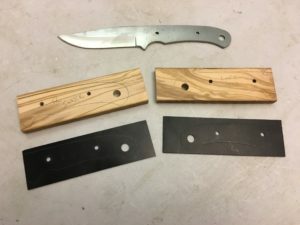 I’m going to say right now that this is Part 1 of a 2 part blog, this detailing how to assemble the handle on a kit knife, the second part will be how to make the knife blade itself. Right. There, I’ve said it so I have committed to part 2 now. Anyway… On with the build. The knife kit itself is pretty simple. You get a blade, two pieces of material for the handle (in my case olive wood), a couple of liners to go between the blade and the handle material (optional but can add strength and a nice visual contrast), two bolts for securing the handle to the blade and a metal tube for passing a lanyard through. Once you have assembled all the parts you need for the build it’s time to get making! 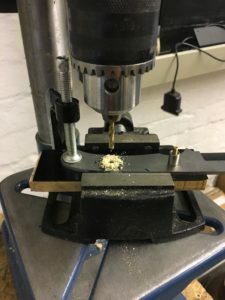 The first step is to drill the fixing holes for the bolts and the lanyard tube through the scales (handle material) and the liners (if using). 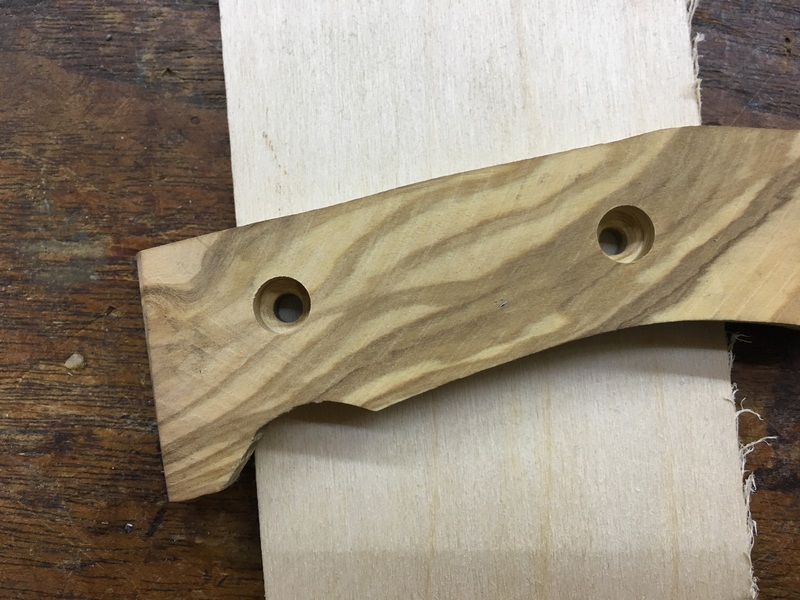 These holes need to line up perfectly, and be at exactly 90 degrees, so I clamped the handle of the blade to both my wooden scale and the liner and then used the drill press to go through the existing hole in the blade handle (after measuring it of course). Once complete I attached the bolt through the hole I had just made to make sure that it couldn’t slip out of alignment as I drilled the next two holes, one for the second bolt and the other for the thong tube. Before removing the bolts and clamps I marked the liner material around the edge of the blade, so I could cut it out on the bandsaw, making sure I also noted which side of the blade it belonged to. 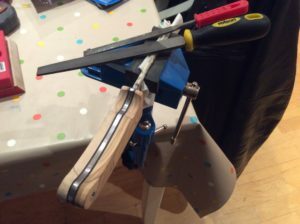 I then removed the bolts and clamp, removed the liner, then placed the bolts through the handle scale and blade again so I could mark up the wood for cutting. Once complete for one side I flipped the knife over and repeated the drilling / marking process again. The next job was to roughly cut the handle shapes out. As I previously mentioned I used the bandsaw at the hackspace to do this but this could easily be done with any handsaw, or even files and wood rasps. 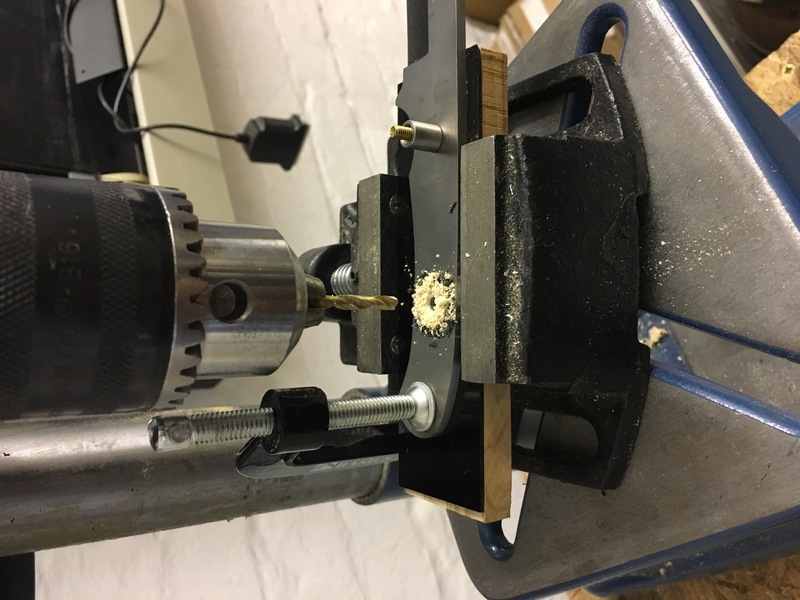 There are a number of different bolts / pins / fasteners that you can get to secure the scales onto the knife handle so this next step my not be necessary but I had to countersink the heads of my bolts into the handle so I used a larger drill bit (sized to the bolt head) to drill about halfway into the wood giving me a stepped hole. 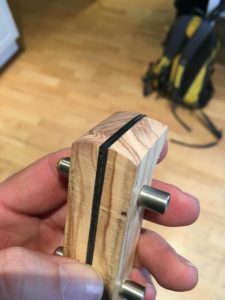 I actually hacked together a step drill bit to do this to give me a nice flat shelf at the base of the hole but just countersinking would work just fine. 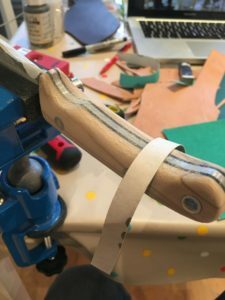 At this stage the handle scales are almost ready to attach to the knife blade, however it will make life much easier to precisely finish the blade end of the scales first. Once attached to the knife it would be very difficult to get abrasives to the end of the scales without ruining the finish of the knife so this is best done now. To make sure the ends were symmetrical I attached them together using the bolts I had used earlier, and that will be used to eventually permanently attached the handle to the blade. I used the belt sander in the hackspace to do the shaping, but again rasps, files and sandpaper would work fine. Now its finally time to attach the scales to the knife. 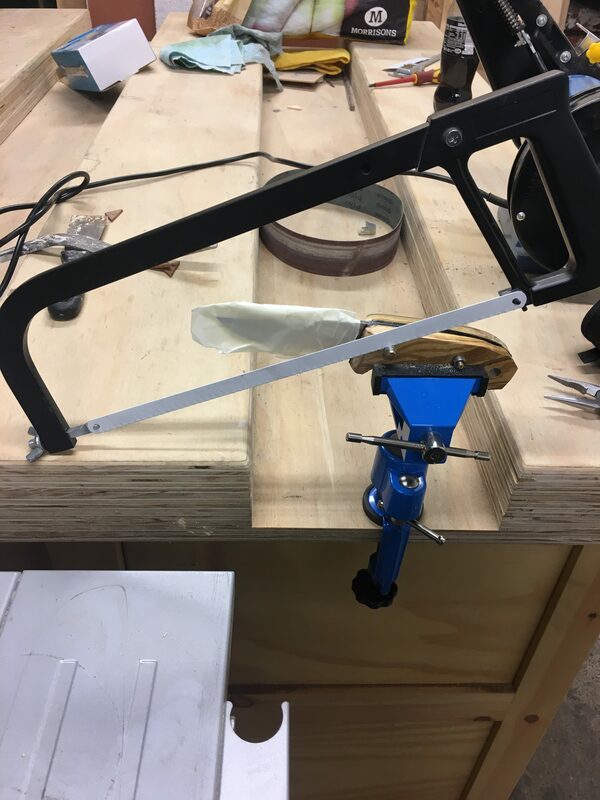 In addition to the bolts that connect the two halves of the scales a two-part epoxy is used to glue all the parts together. Due to the rather short working time of the epoxy, typically around five minutes, it is definitely best to dry fit all of the parts together to check for a good fit. Once you are happy everything will fit wrap the sharp part of the blade with masking tape, and then mix up the epoxy and attach the all parts together, ensuring that everything, including the bolts, gets a good coating of epoxy and then apply clamps (trying not to let the epoxy squeeze out get on the clamps or you’ll glue them to the knife as well!!). As I mentioned earlier the working time of the epoxy is approximately five minutes, but its advisable to leave the clamps on for at least 24 hours to ensure the epoxy is fully cured. 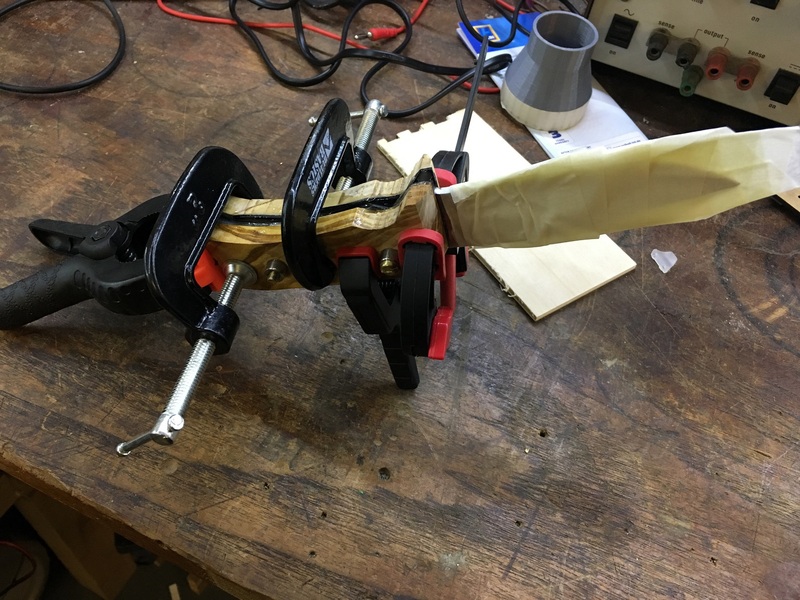 Once the epoxy is fully cured the clamps can be removed and the shaping of the handle can being. The first job is cut the bolts flush to the wood. You have to take care while doing this not to overheat the bolts as it can affect the strength of the epoxy, so I chose to cut these off with a hacksaw instead of grinding them off on the belt sander. From there I used a wood rasp to remove the bulk of the material until I got close to the profile of the blade, then switched to files to get the wood closely profiled to the metal. I then switched to the belt sander again to remove some of the width from the handle, rocking the blade left and right slightly to give it a curved profile for a nice feel in the hand. 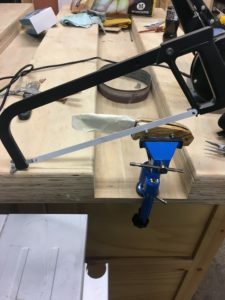 It is important to do this shaping over the metal platen on the belt sander as this will ensure that the metal bolts are ground away at the same rate as the soft wood on the handle. To finish the handle I used small strips of sandpaper, starting at around 120 grit and then moving up to 400 grit, and pulled them around the handle until I had a nice smooth finish, paying close attention to the bolts making sure they were nicely polished. The final step is then to add a finish to the handle, I chose boiled linseed oil which I applied with a cloth in several coats, rubbing off the excess between coats. The kit I purchased also included a leather sheath that I need to put together so I will include that in a blog post soon.